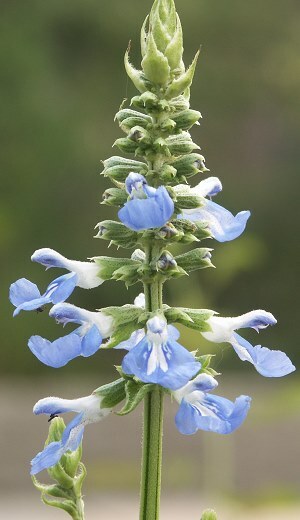 This is a fast growing, true blue Salvia that in only one season can grow to 3 feet or more. Resembling a small stand of Bamboo, Bog Sage is an elegant addition to the perennial garden. Bog Sage does best in full sun with lots of water. It can be grown in partial shade but it may become a little squirrelly. Bog Sage blooms all summer and looks great with almost everything. Cut back to the ground after bloom. This plant is sometimes available in plug trays. These trays hold 128 of all the same plant. They are a great low cost way to fill a lot of space. Each cell is 3/4 of inch by an inch. Check here to see if Bog Sage Plug Trays are available.